HONOLULU – A pedestrian found a live snake on a Chinatown sidewalk at about 7 a.m. Tuesday morning and turned it in to police. 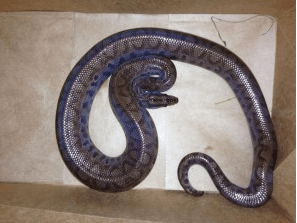 Police notified the Hawaii Department of Agriculture (HDOA) and inspectors were immediately dispatched to pick up the two-and-a-half foot long snake, which was later identified as a non-venomous rainbow boa constrictor. The snake was found on the sidewalk on Nuuanu Ave. fronting the Kukui Plaza condominium. Rainbow boas are native to Central and South America and can grow up to six feet in length. In the wild, their diet consists of rodents, birds, lizards and possible aquatic animals. Snakes are illegal to possess and transport to Hawaii. The HDOA urges those who spot illegal animals or who know of persons possessing illegal animals to call the state’s PEST HOTLINE at 643-PEST(7378). Snakes and large lizards have no natural predators in Hawaii and pose a serious threat to Hawaii’s environment because they compete with native animal populations for food and habitat. Many species also prey on birds and their eggs, increasing the threat to our endangered native birds.